1. Fill half the stainless steel glass with a mixture of crushed ice and 3 tablespoons of salt. 2. Mix it well for about 30 seconds and then let sit. 3. In the other stainless steel glass, put only crushed ice and cool tap water. 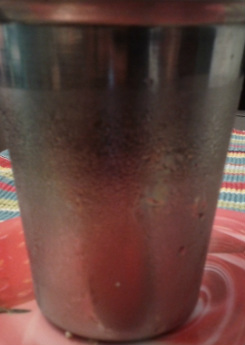 The steel glass should be half way full of ice and fill tap water just enough to cover the ice. 4. What do you see? Frost starts to form on the outside of the steel glass containing the ice and salt mixture. Now look at the liquid moisture on the outside of the steel glass which contains ice only. Frost is light deposits of small, thin crystals of ice that form on cold objects when water vapor changes directly into a solid. Air trapped inside the ice crystals give frost its white color. When air comes in contact with a surface whose temperature is below freezing (32 degrees Fahrenheit or 0 degrees Celsius), frost is formed. 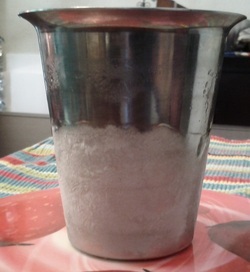 Salt lowers the temperature of the already icy water below freezing. This brings the temperature of the inside of the steel glass to below-freezing. When air comes in contact with the outside of the steel glass, the water vapor which is always present in the air, changes directly into ice without first changing into water. This process of a gas changing to a solid directly, without undergoing the liquid stage is called sublimation. You usually find frost in nature on clear, calm, and cold nights when there is a relative moistness in the air. Frost forms directly on objects like leaves, glasses and cans. Dew forms on the other steel glass because the mixture of the melting ice and water is just at freezing and the temperature outside the steel glass is warmer.